a runner on 1st and a hard hit ground ball through the right side of the infield, which the right fielder must quickly field and throw to third (3rd) base. (5.) 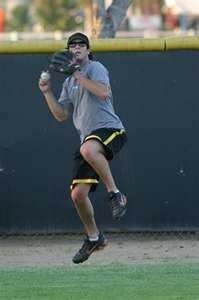 Field the ball with your Glove side foot in front, which allows you to immediately take a Crow Hop which produces a strong, accurate throw. I have referred to a player taking a Crow Hop, assuming everyone knows what that is and I apologize for that assumption. 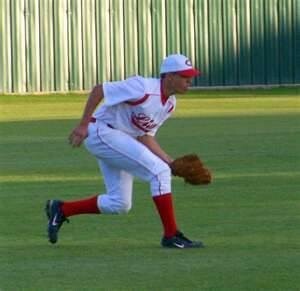 Younger players, some older too, will attempt to Quickly throw the ball back into the infield without properly setting and beginning forward momentum before throwing. This is where the Crow Hop skill is required. “How does taking longer to throw the ball make it get there faster?” A very logical question from a Tee-Ball player. Divide your team, facing one another about 25’ - 35’ apart, as it’s important to learn the actual crow hop maneuver before unleashing velocity throws, and close is better for that purpose. Begin the drill by having your players use an exaggerated form of the crow hop, then graduate to proper form and increasing the distance of the throw. This may sound elementary, but remember, the most intricate and complex skill begins with basics. Beware of players taking 2 steps, as this is not the normal correct method and you don’t want them picking up a bad habit.